A large 13th-century Seljuk caravanserai located in the town of Sultanhanı, Aksaray Province, Turkey. 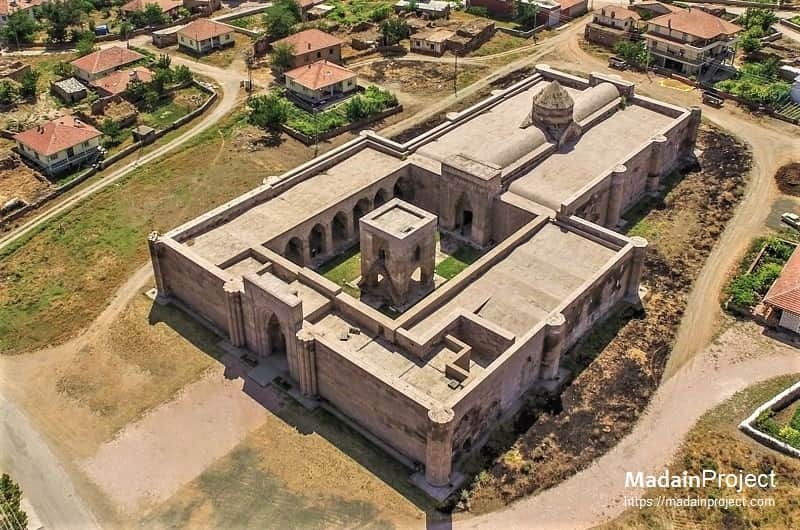 It is one of the three monumental caravanserais in the neighbourhood of Aksaray and is located about 40 km (25 mi) west of Aksaray on the road to Konya. The khan is entered at the east, through a pishtaq, a 13-m-high gate made from marble, which projects from the front wall (itself 50 m wide). The pointed arch enclosing the gate is decorated with muqarnas corbels and a geometrically patterned plaiting. The recently restored kiosk-style mosque inside the main courtyard of the complex, it is situated immediately after entering from the main eastern entrance. The square stone kiosk-mosque (köşk mescidi), the oldest example in Turkey, is located in the middle of the open courtyard. Eighteenth century drawing of the Sultan Han, with the floor plan to the lower right and the mosque in the middle of the main courtyard, with the northern archway and stables. It is one of the three monumental caravanserais in the neighbourhood of Aksaray and is located about 40 km (25 mi) west of Aksaray on the road to Konya. Gabriel, Albert. Monuments Turcs d'Anatolie, 93-98. Paris: Editions de Boccard, 1931-1934. Yalman, Suzan. (2012). ‘ALA AL-DIN KAYQUBAD ILLUMINATED: A RUM SELJUQ SULTAN AS COSMIC RULER. Muqarnas Online. 29. 151-186. 10.1163/22118993-90000186. Acun, H. Anadolu Selçuklu Dönemi Kervansarayları. Ankara: Kültür Bakanlığı Publications, 2007, pp. 460-461; 463. Stierlin, Henri, and Anne Stierlin. Turkey, from the Selçuks to the Ottomans, 240. Köln, Germany: Taschen, 1998. Sterrett, J. The Wolfe Expedition to Asia Minor during the Summer of 1885. Boston, 1888, p. 16. Blessing, Patricia. Rebuilding Anatolia after the Mongol Conquest: Islamic Architecture in the Lands of Rum, 1240-1330. Farnham: Ashgate Publishing, 2014. (Birmingham Byzantine and Ottoman Studies; 17), p. 174. Çayırdağ, M. Kayseri Tahrihi Araştirmalari. Kayseri, 2001, p. 35. Hillenbrand, R. (ed.). The Art of the Saljuqs in Iran and Anatolia. Proceedings of a Symposium held in Edinburgh in 1982, 1994, fig. 6.44, p. 552; 6.45, p. 349; plate 250, p. 347; plate 251, p. 348. Jerphanion, G. de. Mélanges d’Archéologie anatolienne. Mélanges de l’Université Saint-Joseph, tome 13. Beirut, 1928, photo 1, fig. 4. Tozer, H. F. Turkish Armenia and Eastern Asia Minor. London, 1881, p. 161. Hillenbrand, R. Islamic Architecture: Form, function and meaning, 1994, fig. 6.39, p. 552. Kenneth Hayes (2010). "The Wooden Hypostyle Mosques of Anatolia: Mosque- and State-Building under Mongol Suzerainty" (PDF). See Crane, Muslim Patronage in Saljuq Anatolia, 109. Ertug, Ahmet. The Seljuks: a journey through Anatolian architecture, 219. Istanbul: Ahmet Ertug, 1991. The Seljuk Han of Anatolia. "Sultan Han Aksaray". Accessed December 14, 2005. http://www.turkishhan.org/sultanaksaray.htm. Unsal, Behçet. Turkish Islamic architecture in Seljuk and Ottoman Times, 1071-1923. London, 1959, p. 49.